Our volunteers Neha Baria and Aman Haidary are helping our patients at mealtime. A new initiative is providing greater support to Blacktown Hospital patients who require feeding assistance. Starting with the aged care ward, the Making Mealtimes Matter initiative is being progressively rolled out across Blacktown and Mount Druitt hospitals. As part of the initiative, staff are required to indicate the level of assistance a patient requires at mealtime. This then generates a colour-coded slip to highlight whether the patient needs full or partial support to eat. The new process ensures patients receive the meals along with the appropriate feeding assistance. 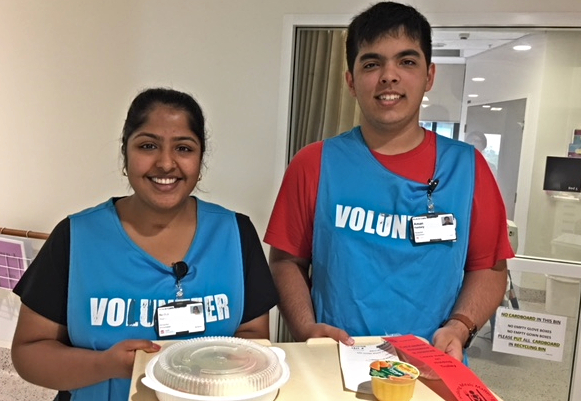 The program, which was established in September 2018, sees volunteers assisting with patient set-up for meals and feeding patients identified as needing full feeding assistance. Senior clinical dietician Barbara Hannah congratulated all the nursing and food service staff and volunteers. “It’s great that our teams have been able to roll out the next phase of the Making Mealtimes Matter initiative,” Barbara said. “Special thanks to the volunteers for the integral role they play in establishing the program. “This program means that our patients are receiving better care and receiving better assistance where required.